Take a look through our range of 8 seater modern garden furniture. The contemporary garden tables in this range are extendable tables that seat up to 8 people. They are sold as contemporary garden furniture sets, meaning that chairs are included in the price, and you can choose from a number of chairs to pair with your table. We are specialists in aluminium garden furniture, with almost all of our garden furniture made from this high quality material. Our modern garden table and chairs sets are no exception. All are made from cast aluminium, making them weather resistant and low maintenance. Aluminium doesn’t rust or rot, giving our contemporary 8 seater garden furniture an advantage over wooden and cast iron garden furniture. Even when left outside over autumn and winter, our cast aluminium tables and chairs will survive without rusting, rotting or splintering. Achieving the same survival through the seasons of teak or iron furniture means sanding, varnishing and oiling. Even then, there’s still a risk of deterioration due to the elements. Cast aluminium stands out as the cost-effective choice for outdoor furniture, requiring no special efforts to withstand the weather. To clean your contemporary aluminium garden furniture, all you need is a clean, damp cloth to wipe it over. A squirt of any standard glass cleaner and a wipe over will keep garden tables with a tough glass table top clean and shiny too. The Virginia table is an 8 seater modern black garden table entirely in aluminium. It extends from 173cm to 244cm, and is also available in white and grey, all grey, and white and champagne. If you want a modern dining table that suits indoor and garden dining equally well, consider the Florence table. This superb 8 seater modern rectangular table combines a tough glass table top with an aluminium frame. It can be extended to a length of 240cm, and comes in grey, white and grey, black, and white and champagne. If you’re having trouble deciding on a colour, you can order samples to give you a better idea. Once you’ve chosen the colour, complete your modern garden table and chairs set with the right seating. 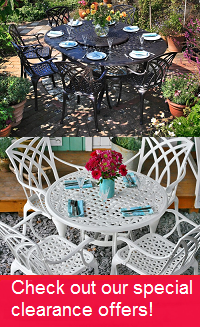 Choose from a number of chairs to combine with your 8 seater garden table. The Milly chair is the default chair that comes with our modern 8 seaters. Note that you can choose this chair in either plain black or black and grey. For £5 and £15 per chair respectively, the Georgia and the Abigail chairs are alternatives in slightly different styles. All of these chairs are stackable, so storing all or some of them when they’re not needed is simple. We offer free delivery on all our modern aluminium garden furniture. So there’s no need to worry about additional charges on the checkout page. Our 8 seater garden table sets are delivered on wooden pallets by our partner couriers Geodis. They offer online tracking of your order from the day of dispatch. They’ll also call you the day before delivery to arrange delivery during a time slot that works for you. For more details about delivery you can have a look at our delivery information page or give us a call. For other questions about our furniture, the friendly Lazy Susan team is on hand to take your calls or answer your emails. From 08:00 to 18:00 daily, they can provide more information about our products and help you with assembly instructions. Call us on 01243 717107 or email us at [email protected]. We try to answer emails within 2 hours during office hours.